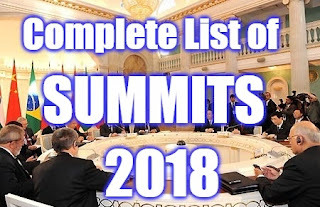 The word SUMMIT means 'an important formal meeting between leaders of governments from two or more countries'. The Summits / Conferences usually held on yearly basis. During these summit meetings, the member countries express their views, strengthen their partnership and sign various agreements. During the time of summit, usually the venue to the next year's summit will be announced. Earlier it was G8, Now Russia has been temporarily suspended. So it was renamed as G7. These summits have generally taken place approximately every eighteen months. The First ASEAN summit was held February 1976 in Bali, Indonesia. IBSA Dilogue Forum (India, Brazil, South Africa) is an international tripartite grouping for promoting international cooperation among these countries. Establishment - 1991 by Malaysian Prime Minister Mahathir Mohamad. The East Asia Summit (EAS) is a forum held annually. Total Countries – 21 countries (Australia, Canada, Brunei, Chile, china, Taiwan, Hong Kong, Indonesia, Japan, Korea, Malaysia, Mexico, New Zealand, Peru, Philippines, Russia, Singapore, Thailand, United States, Vietnam).